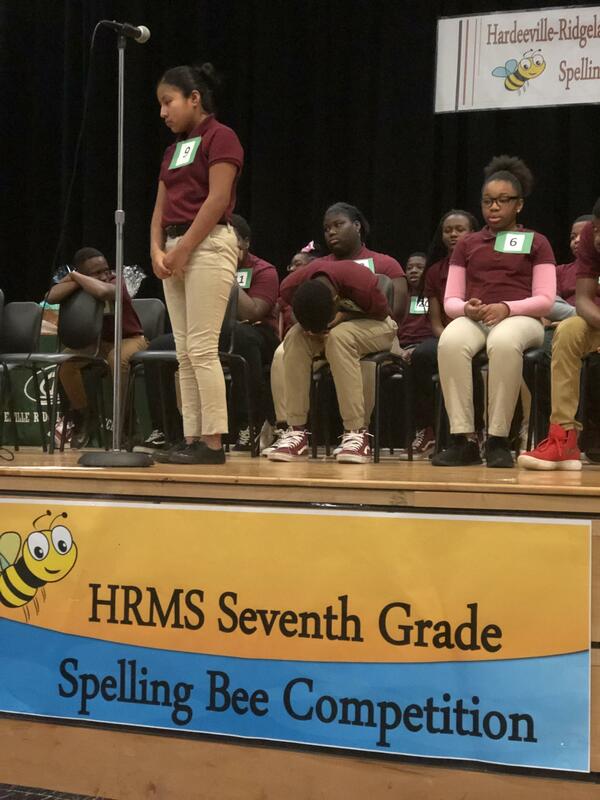 The HRMS Seventh Grade Spelling Bee Competition kicked off on the 8th of January and lasted for three weeks. Sixty-three students signed up for the competition this year in a bid to win the title of "Spelling Bee Champion" and to win exciting prizes. Competitors came out blazing with words but soon it was down to 30 for the semi-finals. As the finals of the competition approached, the top twenty could be seen with their spelling word lists in hand practicing everyday at lunch and every free time they got. In the end Bryan Villegas, who won all three rounds of competition, came out on top and walked away with the coveted title of "HRMS Spelling Bee Champion 2019," a trophy and other prizes. Finishing second was Brianna Sanders and rounding off the top three was Amariana Rollins. The competition was well supported by our superintendent Dr. Rechel Anderson and Principal Eugene Bellamy. Next year promises to be even greater as we look forward to continue building our students' literacy development.